Visiting the beautiful Shrine of St. Therese on an unusually warm early March afternoon, and being greeted by the frenzied sound of chickadees in the trees—anticipating spring—it’s not hard to imagine the pangs of separation that would come from leaving a home here on this gorgeous beach. And then, as a pod of sea lions make their appearance off the shoreline, followed by the echoing sighs and blasting breath of two humpback whales passing by, I understand why staying busy is probably a good antidote to thinking about leaving. Jack and Jeanne Jordan have been caretakers and full-time residents here at the Shrine of St. Therese since 2007; this March, 2015, will be their last month of living at the Shrine before they move on to new adventures. And, they are staying very busy, but for Jack and Jeanne that is a way of life. Introduced to the Juneau area, and the Shrine, by their daughter who was serving here in the Jesuit Volunteer Corps, it didn’t take them long to fall in love with this community and volunteer for the on-site caretaker position at the Shrine. Though they didn’t know a lot about the Shrine, they both had a strong desire to serve and to deepen their relationship with God. Jeanne had recently been on a retreat that emphasized the importance of being in a position of giving and receiving love; and, she felt that the Shrine of St. Therese might be such a place. That has certainly been true, she admits. 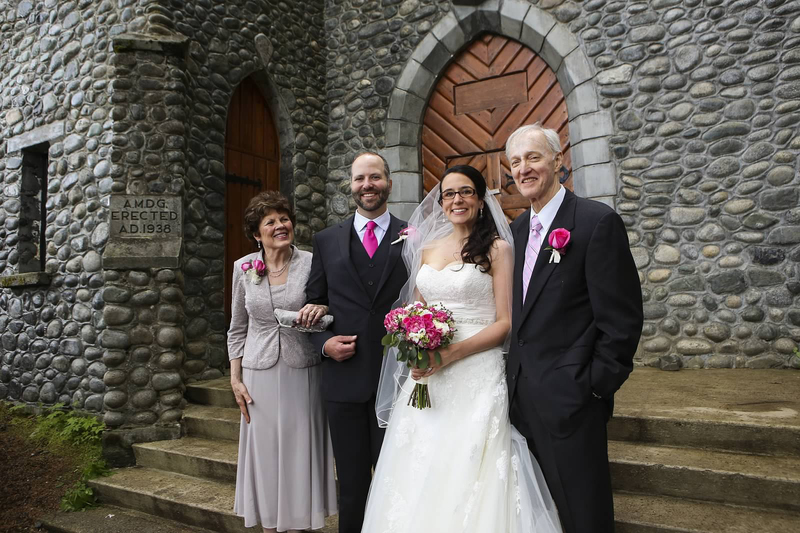 Jeanne and Jack Jordan stand in front of the Shrine chapel with their newly married daughter, Katie, and her husband George Schaaf. Having raised their family in Palmer, Alaska, Jeanne was retired from work as secretary for St. Michael Catholic Church and Jack from his long career as a Fish and Wildlife Trooper. 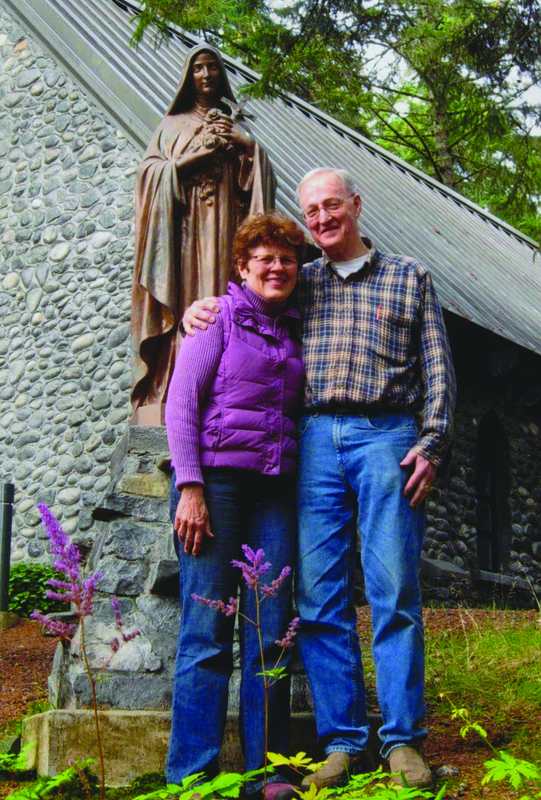 Jack and Jeanne met in Alaska as Jesuit Volunteers while teaching at the Copper Valley School in the 1960’s. Since their marriage, they have remained active Catholic volunteers in parish and community ministry. Jeanne and Jack Jordan in front of the Shrine of St. Therese chapel. Jeanne feels that her true calling is to hospitality—she is most comfortable in the background and has a love for people of all ages—and in that regard the Shrine has made great use of her abundant gifts. 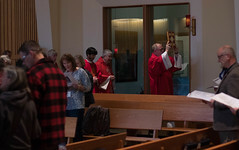 One of her favorite memories from their time at the Shrine is preparing for the summer Sunday liturgies, getting to know the various priests who come to celebrate Mass, and sharing her homemade specialties at the social after Mass. When the Jordans first arrived at the Shrine, Jack was still commuting to a part-time job on the North Slope, so Jeanne often had to problem-solve on her own, with the indispensable assistance of long-time Shrine volunteer and maintenance worker, Sam Bertoni. She laughs, remembering an incident where she told Sam, “I think there’s a monkey or something living in here… .” The bananas on her cottage counter were mysteriously disappearing and she felt something else was living in the caretaker house. Sam, ever resourceful, set a live trap under the kitchen sink, baited with a banana, and in short order a beautiful mink was peering out from the cage—‘the mink under the sink,’ was sent back to the forest. One unexpected result of getting rid of the mink was getting smaller unwanted visitors to the cottage, leading to the acquisition of two cats. Lucky for the new Shrine caretakers (Deacon Jeff and Lisa Volker, who will arrive at the end of March), the mice are no longer a big problem. And the remaining Shrine mouser, Leo the yellow tabby, will be staying in residence. It was a difficult decision, but Jack and Jeanne felt that Leo would be most happy staying at the Shrine, where he has become a greeter in his own right—welcoming visitors to the Shrine grounds, and always eager to offer his feline affection and companionship. Today, caretaking at the Shrine of St. Therese entails overseeing the day to day operations of 5 overnight rental facilities (ranging from the tiny hermitage to the Shrine Lodge that sleeps 20), preparing for liturgies and events at the Shrine chapel, and communicating regularly with Shrine Executive Director, Deirdre Darr, for the care of the Shrine grounds, systems and other needs as they arise. It’s a big job, and couldn’t be done without the assistance of part-time help, as well as so many community volunteers. During the busy summer season, the Shrine rentals are booked solid. In the winter, there is more time for maintenance and upgrade projects. When I visited Jeanne recently, she and Shrine assistant Nanette Brown had just finished doing a ‘deep clean’ of the Shrine chapel and loft. Jack and Jeanne say what they’ll miss the most about the Shrine is the people—the loving community that cares for and visits the Shrine. “There’s something about this place,” shares Jack. “It has a special quality that goes beyond its beauty and peacefulness; it has a sense of quiet joy. It’s hard to find the words to adequately describe.” There is a sense of tranquility and healing that is very apparent in what Shrine visitors share in guest books. Even local visitors are impressed by the accommodations surrounded by the beautiful and holy space that the Shrine offers. 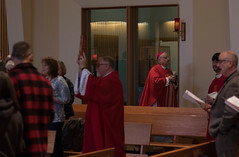 This effect of the Shrine on visitors reminds Jeanne of a quote often attributed to St. Francis: “Preach the Gospel at all times; if necessary, use words.” The Shrine is always blessing its visitors without words. They’ll also miss that sense of belonging that comes from being an integral part of something so sacred and special as the Shrine. They recall the dedication and sacrifices made by so many people over the years to make the Shrine what it is today! It’s been hard work for sure, but overall a time of grace and growth for them. Learning to balance the ‘Martha’ versus the ‘Mary’—the endless tasks to be done versus taking the time for prayer and rest—has definitely been a challenge. The entire Shrine community wishes them blessings, good health and joy in abundance in their future endeavors. Thank you, Jack and Jeanne Jordan!